Federal agencies are forfeiting billions of dollars by failing to implement the recommendations of their inspectors general, according to a House Committee on Oversight and Government Reform report. The report, released Tuesday, estimates that executive agencies could have saved more than $67 billion in 2012 by implementing thousands of recommendations from their inspectors general. The report notes that the number of unimplemented recommendations rose by about 50 percent over the past four years, while the potential savings lost more than doubled. Almost 11,000 recommendations, at a potential savings of almost $30 billion, were left on the table in 2009; in 2012, close to 17,000 recommendations were neglected at a potential loss of more than $67 billion. The report comes as mandatory, across-the-board budget cuts totaling $85 billion for the fiscal year are beginning to take effect. The Oversight Committee keyed the release of the report to a Tuesday morning hearing on the implementation of recommendations by the Transportation and Education Departments’ inspectors general. 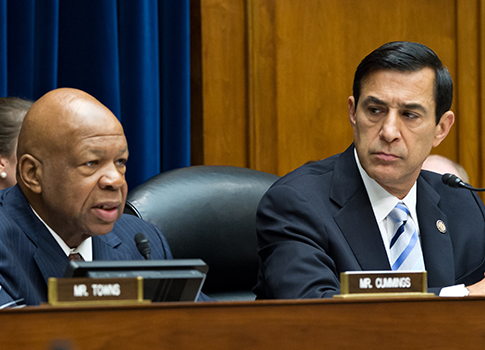 "With my partners on both sides of the dais, today we’re starting a much greater dialogue with our IGs, a much greater dialogue with the changes that need to be made if in fact government, outside of this body in the executive branch, can do better, do quicker, to save the taxpayers money," Oversight Committee Chairman Darrell Issa (R., Calif.) said in his opening statement. Committee ranking member Elijah Cummings (D., Md.) praised the work of the inspectors general, calling them "in many instances our last line of defense" in his opening statement. Much of the hearing centered on the effect that sequestration would have on the Transportation and Education Departments. Both departments claimed the cuts would hurt critical functions. Some congressman expressed doubt about the true implications of the cuts. John Porcari, deputy secretary for the Department of Transportation, asserted that the sequestration would cause flight delays because the department would have to furlough air traffic controllers, but Rep. Jim Jordan (R., Ohio) pressed him on his claim. Jordan asked if Porcari had any studies to back up his assertion, and after learning that he had none, exclaimed, "So once again, it was a guess!" Jordan noted in his opening statement that Secretary of Education Arne Duncan claimed that teachers were getting laid off because of sequester, a claim that the Washington Post debunked. "If government agencies and secretaries who head those agencies would spend more time implementing the IGs’ recommendations and less time scaring the American people with all the political statements they’ve made regarding sequestration, the taxpayer would be a lot better off," Jordan said. Both inspectors general said they have good relationships with their departments, but both noted concerns. The Department of Education has had longstanding problems resolving audits in a timely way. Ninety percent of the audits by the office of the inspector general were not resolved within the mandated six months, and the department lost the opportunity to recover $415 million because the statue of limitations expired, said Kathleen Tighe, the department’s inspector general. "Is that acceptable performance by the department?" Rep. Jackie Speier (D., Calif.) asked of the delayed audit responses. Tighe testified that the department likely would not have recovered all of the money had they quickly responded to those specific audits. However, she also said in response to a question from Issa that the future savings likely would have exceeded $415 million. Transportation Department inspector general Calvin Scovel said he has identified about $1.7 billion in potential savings within the Department of Transportation. He also noted that while his office has a "very good relationship" with the Transportation Department, not all inspectors general have the same strong relationship with their agencies. "There’s an old saying among IGs, that if you’ve talked to one IG, you’ve talked to—only one IG," Scovel said. "Everyone is different, and their atmosphere is different with their agency and their working relationship is different." Partisan sniping over sequestration characterized much of the hearing, with Democrats bemoaning the cuts and defending the executive agencies while Republicans questioned the need for so much money. One representative expressed exasperation at the direction of the hearing and the testimony of the agency heads. "When you have the IGs’ recommendations … you’ve got money left on the table, but yet in a hearing like this, in a time when there’s now real cuts going on … it’s now a time to squeal and say, ‘Here’s the problems we’re having,’" said Rep. Doug Collins (R., Ga.) told the witnesses. This entry was posted in Politics and tagged Darrell Issa, Department of Education, Department of Transportation, Elijah Cummings, Federal Bureaucracy, House Oversight and Government Reform Committee, Obama Administration, Obama Economy, Sequestration. Bookmark the permalink.